Musicians have a history of being politically outspoken. But when everyone has a platform upon which to voice their opinion on a worldwide scale, speaking out on issues without acting can ultimately fall short of producing concrete results. Over the last several years, there’s been a noticeable change in the way artists, producers and DJs have approached activism and outreach. Instead of posting pictures or writing about issues, they’ve begun providing web links to organizations they support with calls to action. While pictures and blurbs might communicate to readers, “educate yourself about this, it’s happening,” these new declarations take a firmer stance. They’re just a minor change in attitude and rhetoric—but facilitating action doesn’t always require a grand gesture or display. Sometimes all you need to do is make it easier for people to get involved. The next progression in social-media-driven artist activism has come in the form of a series of compilation albums. Usually sprawling, cross-genre affairs, these projects leverage new tracks from artists across the electronic and dance music spectrum by tying them to specific issues. You no longer have to take an interest in the artist themselves or their online presence to be exposed to the causes they support; they’re right there, staring you down from the same page you want to download that new track from. The first of these compilations I noticed came during the relief effort after Hurricane Harvey hit Houston, Texas and surrounding cities near the Gulf of Mexico. Only days later, Praxis Houston was released. Organized by artists Malcriado and Englesia and featuring work from producers like Laurel Halo, Endgame and Chino Amobi, the project pledged to donate 100% of raised funds to the Greater Houston Autonomous Relief, a coalition with the mission “to help each other instead of relying on corporations or the state.” At first surprised by not only how quickly the compilation had come together but also how solid and honest its cause was, I began to notice an abundance of like-minded projects with a similarly direct, DIY spirit. Most of these compilations live on either Soundcloud or Bandcamp, both sites that feature direct artist-to-fan distribution and ample space for description. Without these key features, revenues would travel through labels or digital distributors before reaching the causes they were meant for, and detailed mission statements and links would be reduced to metadata and ineffective liner notes. One of the standouts available on Bandcamp is Physically Sick 2, the second installment in a compilation series by Allergy Season and Discwoman, curated by Umfang, Frankie Decaiza Hutchinson and Physical Therapy. For the project, the curators aligned with Brooklyn Community Bail Fund, which helps “those caught in the insidious, punitive cycle of bail and prison” by using 100% of the compilation’s profits to pay bail for those who can’t afford to. 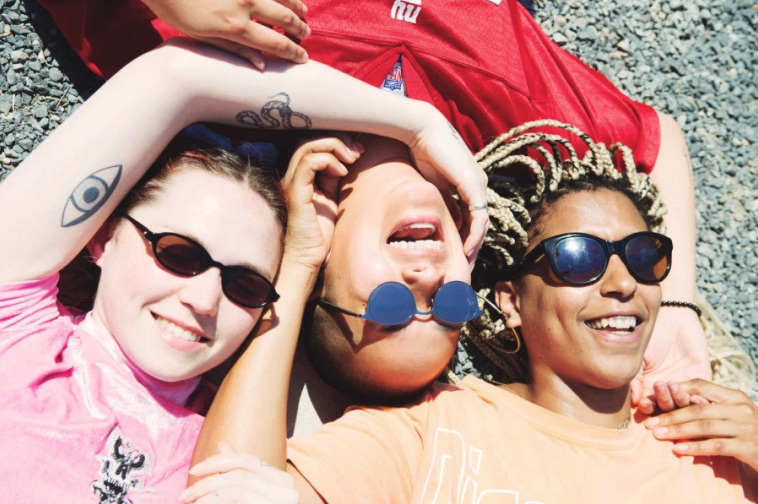 The stacked lineup—which features a whopping 46 artists, including Elysia Crampton, Fatima Al Qadiri, Varg and Tzusing—not only made this project one of the strongest compilations of the year but also proved that when the right people get behind the right cause, many more will instinctively follow–and that Allergy Season and Discwoman are the perfect groups to instigate this kind of change. A project of equal stature but with a much wider mission statement, last year’s Co-Op appears more like a long-term collective than a one-off project. Instead of picking a single cause to support, the network of artists behind the compilation have provided links to 35 organizations they support in the “struggle for equality and aid”. Their first project, which features works by artists like Why Be, Ausschuss, Born In Flamez and Swan Meat, is available in full on Soundcloud and via free download link but is given on a “trust-basis”. Anyone who listens is expected to donate their time or money to a group that “protects marginalized groups worldwide.” For anyone living in Germany or the US, there are a wealth of options to choose from. For those interested in supporting other like-minded groups, new compilations like these seem to be appearing more and more frequently. Give Soundcloud and Bandcamp a browse, and if you’re looking for somewhere to start, check out the first compilations from Shxme and Physically Sick. While politically-charged art is nothing new, the influx of artists standing in solidarity for specific causes and organizations, plainly asking fans to pay attention and support, represents an incredibly refreshing approach to activism within the music world. It’s sincere and direct, which is exactly how we need to be.